Having scored 11 goals already, Ronaldo has adapted quickly to life at Juventus and he has credited the Bianconeri's environment for that. 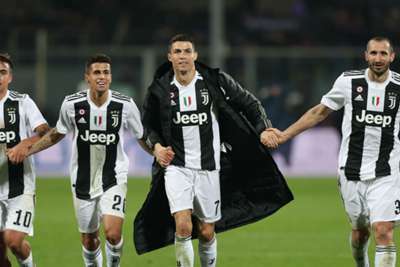 "It isn't right to name someone specific but I can say that this is the best group in which I've played," Ronaldo said in an interview with Italian newspapers. "Here, we are a squad, elsewhere, some players feel bigger than the others. Instead, here, everyone is on the same level, they are humble and want to win. "If [Paulo] Dybala or [Mario] Mandzukic don't score, they are still happy and you see them smile. "For me, it is beautiful, to feel that difference. Also at Madrid they are humble, but here I feel that sense more. "It's very different to Madrid, here it is more of a family." Ronaldo won the Champions League four times with Madrid, having also been part of Manchester United's victorious team in 2007-08. Juventus have not won the competition since 1995-96 and their fans are hopeful that Ronaldo's arrival can end their wait to lift the trophy again. However, the forward has warned that the club cannot become obsessed with the Champions League like Real Madrid did when they were seeking 'La Decima' between 2002 and 2014. "The 10th was a huge obsession, but the moment you can win is when you relax mentally.," Ronaldo added. "Yes, we all want it, but we have to get it step by step. Look at the game with [Manchester] United [which Juventus lost 2-1], if it was a quarter-final we would have come out. "We need a little luck, the right moment, the details."